Duke Corporate Education (DCE) is the leader in the field of custom executive education, having been named number one five straight times by Business Week and The Financial Times.Ãƒâ€š And with a client list is a roster of the Fortune 500, DCE quickly grew out of their Durham headquarters and became a global venture with offices in London, New York, and Asia. 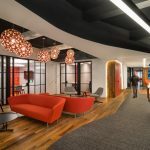 Given that their programs focus on making a real impact in the workplace, DCE wanted a new headquarters with a design that facilitated a productive, innovative environment. So DCE commissioned Alliance Architecture, which had completed several highly successful renovations on the emerging American Tobacco Campus by 2006, to design DCE’s new headquarters in the Lucky Strike Building at the American Tobacco Campus in Durham. John Warasila, AIA, and Vandana Dake were the design principals and architects for Alliance. Dr. Blair Sheppard, who would go on to become Dean of the Fuqua School, and Tim Martin led the DCE team. DCE purchased the historic Lucky Strike Building in 2006, a structure that dated from 1903 and early years on the campus.Ãƒâ€š It housed the factory that Lucky Strike cigarettes were manufactured in for decades, having closed in the 1980’s. The original building is an excellent example of early American industrial architecture.Ãƒâ€š The floor plate is long and narrow with large repetitive windows and is easily illuminated with daylight. The building’s original brickwork, window openings and heart of pine structure and floors were still fundamentally intact, but years of time and neglect had ravaged much of the building. Large openings had been cut in floors and walls for conveyors, the windows all boarded up and sealed years ago. Plus, the roof was failing with trees growing out of it. Alliance’s first task was to develop a strategy for stabilizing the building to stop further decay and collaborate with DCE to bring the building into the 21st century.Ãƒâ€š The roof and windows were all replaced. The existing structure was repaired with a priority placed on retaining original timber columns, beams, decking, and floors. Modern systems for electrical, mechanical, and IT infrastructure were integral to the renovation. DCE practices a collaborative, interactive experience in its teaching. But encouraging that collaboration in a building with a basement with four floors stacked above became a central challenge. The solution? Alliance linked the floors together via two spacious open-communicating stairs between first and second, and third and fourth floors. They included a stacked “mini” atrium to overcome issues of fire separation while visibly and physically tying staff together. The ground floor operates as the reception area and conference center for the headquarters.Ãƒâ€š It features multiple conference rooms and a large cafÃƒÆ’ ©.Ãƒâ€š These areas are heavily used and feature several tables, light fixtures and other elements crafted from artifacts found in the building during the restoration. Throughout the headquarters, an emphasis was placed on saving and restoring historical elements that included old sliding fire doors, wood floors, masonry, and timber columns and beams. Much of the design concept was centered on utilizing natural light in an open plan. Perimeter lighting and corridor lighting was designed to highlight the wood and brick, bringing warmth and life to authentic materials. A feature element at the reception area is a wall made from stacked cross-sections of timber from the original building. The central theme was to let the historic building shine through while thoughtfully integrating modern systems. Today, the DCE headquarters represents a gathering place for the entire company for annual meetings, and a connecting thread to its many worldwide offices via modern technology. Really like this space, outstanding!